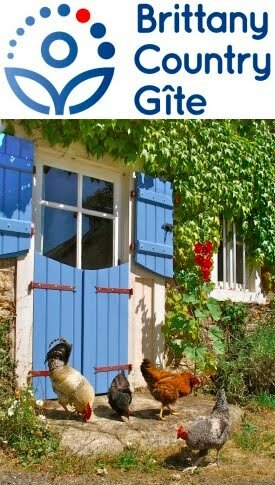 permaculture in brittany: Refurbishing Chairs – Part Two of an Ongoing Quest! 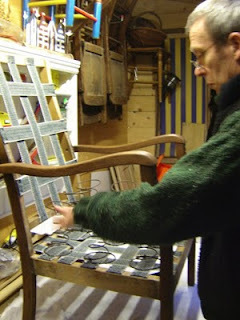 Refurbishing Chairs – Part Two of an Ongoing Quest! If you have something decent to read, and a cosy fire in front of which to read it, you need to get yourself a comfy chair. 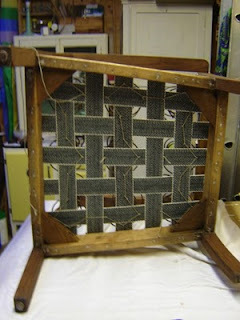 Here are the second set of photos of the chair restoration by our holiday cottage guest and now friend, Richard. He and Leigh are booked in for mid-August, so the dramatic tension is already rising: will he get the chair ready in time? It’s amazing, and a real pleasure for me, to see this “rescue” chair—£5 from Brighton and Hove Wood Recycling Project—lovingly brought back to its former glory. The photos show Richard in his workshop putting the original springs back on new webbing and then the detail of the webbing from below.